90% of Prevention is Knowledge!! ALL BREEDS can cause serious injury; including small dogs and popular "family" breeds. Even the friendliest dogs can be uncomfortable with a child's quick movements and screams. 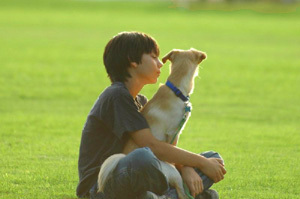 Children tend to get excited around dogs, approaching quickly, talking loudly, sometimes even grabbing. Any one of these actions can easily result in a bite. So what's a child to do? Speak quietly and move slowly around dogs. Before petting someone's dog, always ask permission. If it's okay, approach slowly and quietly. Let the dog sniff the back of your hand, then gently pet the dog's side or under its chin. Never approach someone you don't know if they have a dog. Even with a dog they are still a stranger! Never disturb a dog who is sleeping, eating, caring for puppies, in a vehicle, behind a fence, tied or chained up. Never try to break up a dog fight. Go get an adult. Never try to help a hurt or injured dog. Go get an adult for help. Never tease or chase a dog. Never scream around a dog. Never try to outrun an unfamiliar dog. Instead, try to back away slowly. If approached by an unfamiliar dog, remain motionless. Be still like a tree. If knocked over by a dog, roll into a ball, your knees into your stomach, hands over your ears and lie still. Roll up lie a rock. In a calm and firm voice say "No!" Use backpacks, bikes, or anything you have with you as a shield. Whether you own a dog or not, you can help prevent children from being seriously injured by teaching them these safety tips. REGARDLESS OF THE BREED, NEVER LEAVE A CHILD UNATTENDED WITH A DOG! !